Planter boxes come in all shapes and sizes. However, certain design elements are useful in all planter box projects! 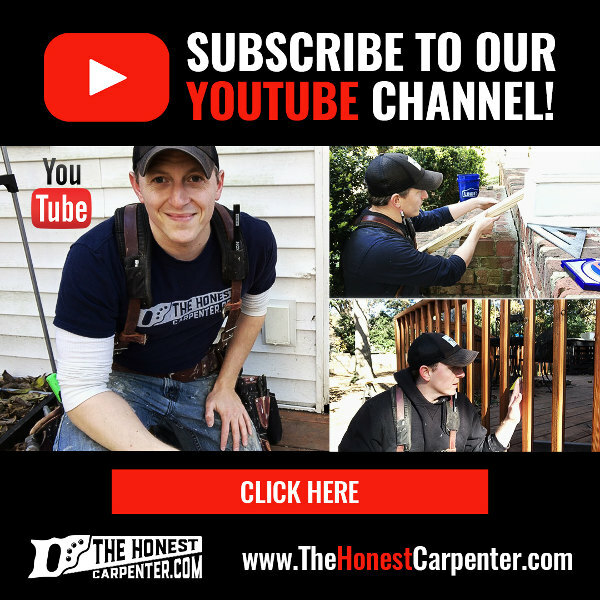 This short article will provide a detailed description of how to build sturdy, long-lasting planter boxes, with a focus on the construction techniques and material selections involved! 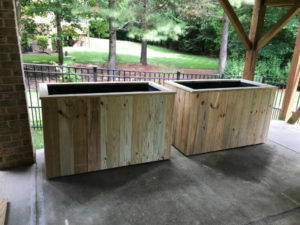 Custom planter boxes with vertical trim and top rails. 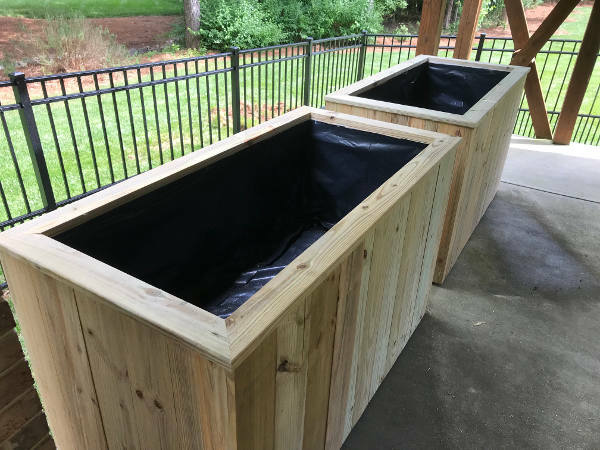 The key to all successful planter box projects is using materials that can stand up to exterior conditions. Boxes will inevitably come in contact with the ground, standing water, and a variety of damp soils and aggregates. 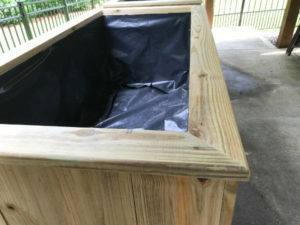 All fasteners in planter box projects should therefore be galvanized, or ceramic-coated. 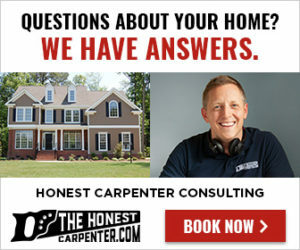 All lumber should be treated, preferably with a GC (“Ground Contact”) rating. I also believe strongly in using a moisture barrier to protect the inner walls of your planter boxes. External conditions are bad enough, but interior conditions of your planter boxes will always be wet and dark. 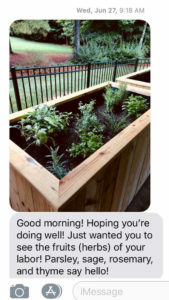 The planter boxes I created for this client were “elevated” beds. The top rails of the boxes were at about counter height, and the floors were lifted off the ground by a deck platform system. 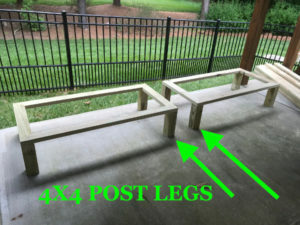 4×4 post legs and 2×4 rails create the planter box platform. This is a great way to get the box up to a better working height so you don’t have to bend over or get on your knees to do some gardening. But, you also won’t have to fill your box with three feet of soil! To create these floor platforms, I simply cut 4×4 posts to a predetermined height (about 14″), and then created a rail system across their tops with treated 2×4 pieces, mitered at their corners. 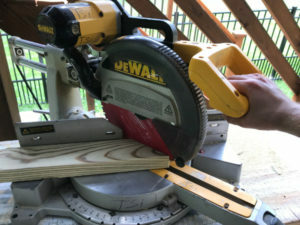 Cut treated 2x4s with a miter saw. I then attached pieces of 5/4 deck board across the width of these frames, creating a platform. The deck boards were installed with a lot space between them (about 1″) in order to create natural drainage fields at the bottom of the box. 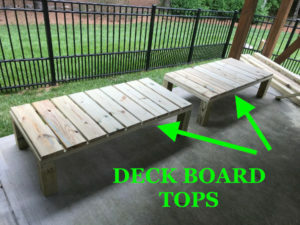 Standard deck board is used to create planter box floors. All of these components were shot together with galvanized framing nails and brad nails. Treated plywood is used to create the planter box walls. To cut plywood panels to size, use a tape measure and pencil to lay out the dimensions of your cuts. Then, use a chalk box to snap long “plot lines” between these measured marks. Use a chalk box to snap cut guidelines on treated plywood. 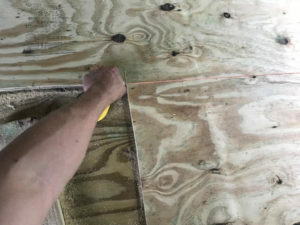 After cutting my plywood components to size, I attached them to the deck platforms by shooting galvanized framing nails through the plywood wall into the edge of the horizontal 2x4s, and into the 4×4 legs. Building the planter boxes this way helps prevent to 2x4s from bowing under weight over time, without adding more bulky structural members. 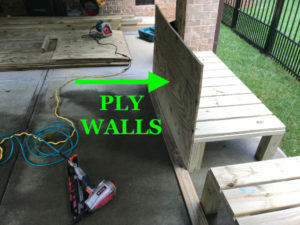 Attach ply walls to all four sides of planter box. 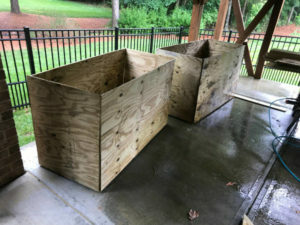 Finished plywood walls on two planter boxes. Ply panels met at the corners, but did not have to be meticulously fastened to one another since they would be further supported and concealed by framing members on the inside, and trim pieces on the outside. With the dimensions of the planter boxes roughly formed, I now installed more interior framing. Screw plywood walls treated top rails. With this rim frame in place, I cut and assembled L-shaped verticals to sit between the rim and the deck platform. Once again, I screwed through the plywood walls into these vertical framing members to trap things in place more effectively. 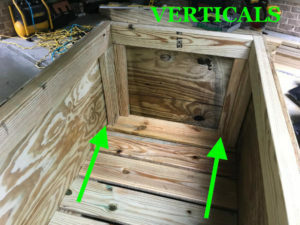 Install vertical supports at inner corners of planter boxes. With this framing in place, the boxes were now extremely rigid! I could drag them around without worrying about damaging anything, so I spaced them a little ways apart in order to more easily trim them. 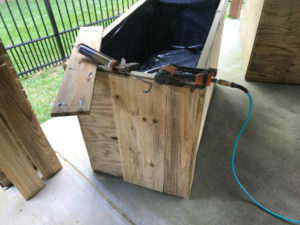 Before I began trimming, though, I took the opportunity to line the interior of the planter boxes with heavy 6-mil plastic. 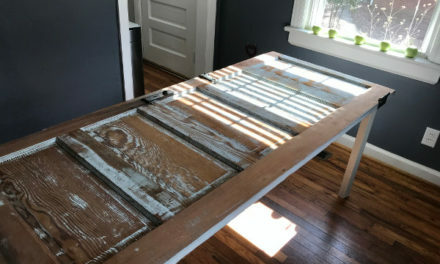 I did this by cutting two pieces that would cover the floor and turn 6″ up the walls, then cutting long pieces that would cover the walls and turn 6″ onto the floor. 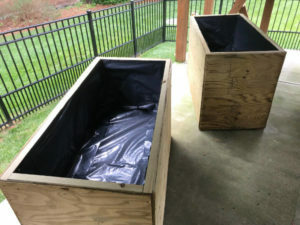 Line planter box interiors with heavy 6-mil plastic for moisture protection. 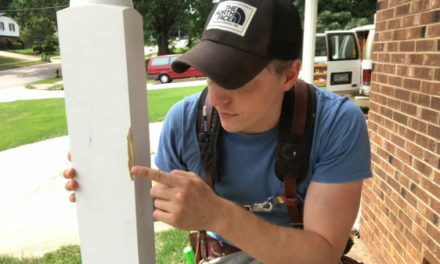 Attach exterior trim to planter box walls with adhesive and brad nails. You could trim these boxes in an endless variety of ways: horizontal decking; galvanized metal; even shake cedar. In this case though, my client opted for tightly spaced vertical trim. 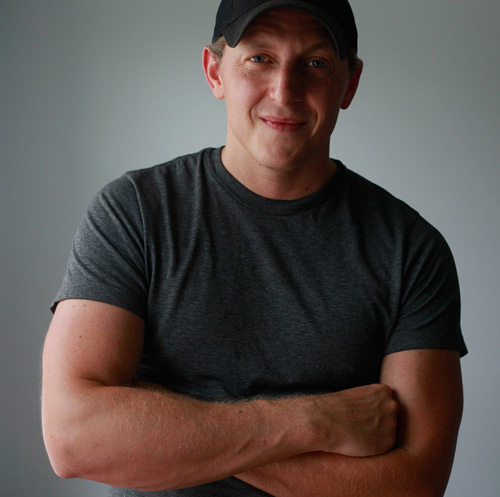 I like the way it came out–it has sort of a cabin look. 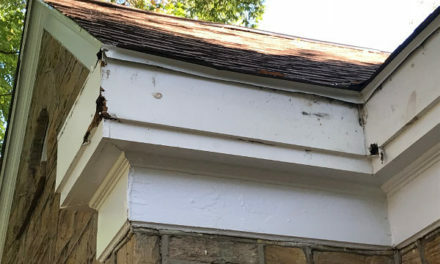 To install this trim profile,I simply attached 1×6 treated trim pieces to the outer walls of the boxes, butting them together side-to-side. Like the plywood walls themselves, I kept the trim pieces lifted 3/4″ off the ground. 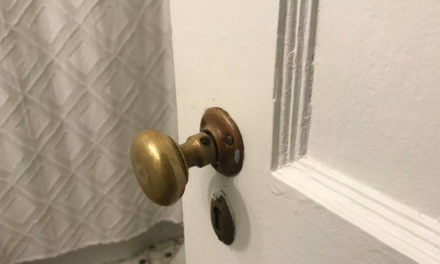 To attach them, I dotted the backs of the pieces with blobs of Liquid Nails Extreme (linked in the “Overview” section), and then fastened them with 1-3/16″ galvanized brad nails, which are not quite long enough to punch through the inner wall. Corners presented the main difficulty. I had to be sure that pieces were staying plumb to the corner they were approaching by measuring from the top and bottom of each new piece. Also, every side of the box required one piece to be ripped to width so corners would meet evenly. Rip trim pieces to custom widths to create square corners. I know that some separation between trim pieces will occur when the drying process begins. But, this glue+brads method actually helps mitigate shrinkage parting because of widespread attachment, and I think the long-term effect will be negligible. 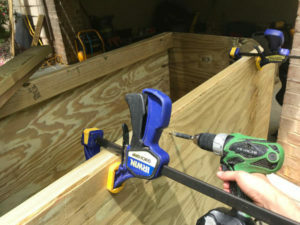 Cut and install mitered 5/4 cap pieces on top edge of planter boxes. 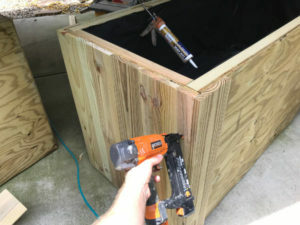 To hide the framing and end grain visible at the top of the box–and also to create a convenient ledge for setting tools on–I installed a flat rail on the top edge of the box to act as a “cap”. 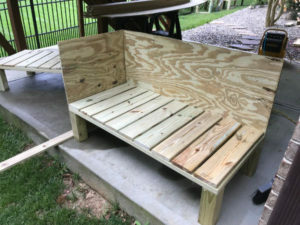 To do this, I ripped down 5/4 deck board so it would be just wide enough to cover the lumber below, plus have a 1″ overhang to the outside: about 5″ in all. I then cut mitered corners on the pieces, and installed them with adhesive and brads, just like the trim boards. I touch-up sanded the rim of the new cap, since this is the area most likely to come in contact with skin and clothing. With the planter boxes assembled, I just gave the adhesive a day to dry, then moved the boxes into their final locations. They felt incredibly strong and rigid, and seemed entirely up to the task of holding heavy soil and water weight. They also looked great. A couple weeks later, I got the perfect follow-up to any custom project…a text from my client, confirming a job well done!